Recently, India won the trophy of Asia Cup 2018 and now they have to tie their shoelace for the Home series against West Indies which is set to be played from October 4 to November 11, 2018. Both the teams will play 2 Test, 5 ODIs & 3 T20 during this tenure. The series will start with a Test beginning October 4 to 8 in Rajkot, which will be trailed constantly Test beginning October 12 in Hyderabad. The 5 match ODI will start from October 21 and will proceed till November 1. The 3 T20 will be played on November 4, November 6 and November 11. Talking about the last Test Series played between the teams was in 2014, India won 2-0, first one by an innings and 51 runs and second won by an innings and 126 runs. 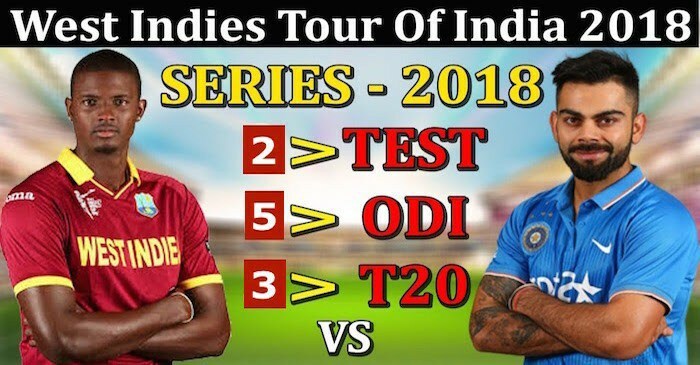 In 2017 West Indies was on India Tour for playing series of 5 ODI and 1 T20, in which India won the series by 3-1 and West Indies won the T20 match. Third T20 - November 11, Chennai. Jason Holder (captain), Sunil Ambris, Devendra Bishoo, Kraigg Brathwaite, Roston Chase, Shane Dowrich, Shannon Gabriel, Jahmar Hamilton, Shimron Hetmyer, Shai Hope, Alzarri Joseph, Keemo Paul, Kieran Powell, Kemar Roach and Jomel Warrican. Get the latest news and updates about the India vs West Indies 2018 Series keep in touch with Bhaiji. We will provide you the best cricket betting tips and prediction. You can also subscribe to our paid services for more accurate and result oriented Betting tips and prediction for this series and all upcoming tournaments.